Remember last episode when Bellamy, Kane, Monty and Indra found themselves trapped in a car? Yeah, they're still there. It's been three hours, and they've finally decided maybe they should do something about the situation. Their master plan is to run for it, but as soon as Bellamy opens the hatch, he's faced with a gun, and everyone is told to get out. Turns out they aren't grounders but other Ark survivors (from the Farm Station, specifically). The survivors include Monty's mom (YAAAAY) but not Monty's dad (AAAWWW) because he 'didn't make it.' Also, Pike, the man in charge of Farm Station, wants all Grounders to die a slow and painful death. He seems like a pretty nice guy, though. Genocidal tendencies aside. Meanwhile, Clarke is being dragged around via rope by an extremely problematic, bounty-hunting newcomer. Why is he problematic? I'll explain in a bit. We saw this newcomer for a brief moment in the last episode when he came into Niylah's trading post looking for Wanheda. He gave Clarke a suspicious side-eye before leaving and proceeded to kidnap her as soon as she left. So now, like I said, he's dragging Clarke around via rope. So Clarke does the only obvious move and collapses, pretending to be unconscious. He lets the rope go with a derisive, "I guess Wanheda is human after all," and proceeds to turn his back on her and fill his canteen with water. My very high hopes for him began to drop because let's face it, that wasn't the brightest move. Clarke - OBVIOUSLY not actually unconscious - attacks him and proceeds to half-drown him. He's having none of it and proceeds to reverse the situation, half-drowning her. When he pulls her out of the water, the red dye has washed from her hair and the warpaint has washed from his face, revealing a) she's actually a blonde and b) he's actually from the Ice Nation. By this point, my reaction to Bounty Hunter was, "Oh no, he's hot. But it's fine, we're good. He won't deter me. I've shipped Bellarke for two seasons and I'm not about to stop now." Meanwhile, The Gang (Bellamy, Kane, Indra and Monty) reach the trading post just in time to keep Ice Nation Newcomer's friend from killing Niylah, since Niylah won't tell him where Clarke was going. (Granted, she doesn't actually know, but points to her for keeping her mouth shut.) Niylah tells The Gang that the other bounty hunter took Clarke, and Pike finds fresh tracks. The Gang sets off on Clarke's trail. Clarke isn't having the best day of her life. She and Bounty Hunter run into three Ice Nation scouts from Bounty Hunter's clan. Bounty Hunter approaches the scouts and proceeds to kill them (apparently, they're not all on the same side), then chase down Clarke. Her getaway attempt is thwarted, but she manages to stab Bounty Hunter in the side before he once again gets the upper hand. By this point my reaction to Bounty Hunter was, "FINE, I'm in love, but I WILL NOT BE SWAYED, I'll love him but I refuse to ship him with Clarke. Plus he's like twice her age. I refuse to ship this. I'll just appreciate him from a safe distance, yep." As Clarke and the Bounty Hunter head away, The Gang arrives and sees them across the clearing. But they're too far away - an Ice Nation army is approaching out of nowhere, cutting off any safe route to Clarke. All Bellamy wants to do is go after her, but the chances of surviving said rescue attempt are low, and the others convince him to wait. The Gang hides in a cave while Indra leaves them, heading to Polis so she can warn Lexa of the oncoming Ice Nation army. The Bounty Hunter wants to avoid the army as well, so he finds an underground bunker where he and Clarke wait it out. Bounty Hunter earned his new nickname, McSteamy, in this scene; as he proceeds to remove his shirt and reveal a back full of intriguing scars and a chiseled physique that's borderline RUDE. My reaction: "This is getting ridiculous. RIDICULOUS. Who said you were allowed to just waltz in and be this way. Who gave you permission." As if that wasn't enough, he heats up his knife in a fire and cauterizes the stab wound Clarke gave him; all without making a sound. Me: "…This just isn't fair." McSteamy and Clarke have a brief discussion and he opens up slightly, telling her he was banished, whereas she took the coward's way out and ran. While they talk, The Gang also discusses why Pike is so dead-set against Grounderkind: when the Farm Station landed, the Ice Nation began killing their kids (and Monty's dad, who went after the kids to save them). They've been fighting Grounders ever since, and he doesn't see a difference between Trikru and Iskeda, which will be a huge problem for Arkadia. While they swap war stories, Bellamy changed into one of the Ice Nation scout's clothes and slipped away, following after Clarke. He finds her, and we have a beautiful but (annoyingly) brief Bellarke moment as he touches her face and begins to untie her. The moment is cut short by McSteamy, who takes Bellamy by surprise. 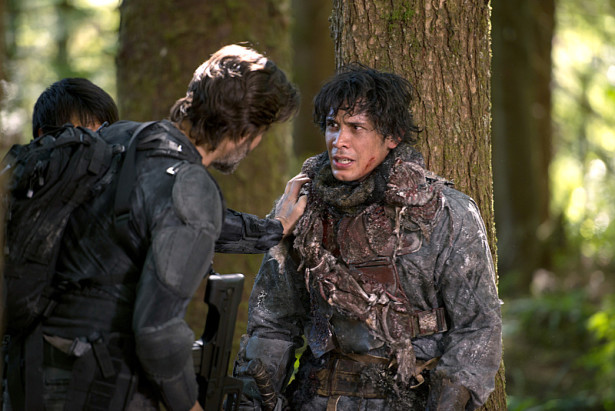 He has a sword to Bellamy's throat, but Clarke pleads with him, begging him not to kill Bellamy. She promises she'll stop fighting him if he lets Bellamy go. So McSteamy reasonably stabs Bellamy in the leg, tells him not to follow them, and leaves with Clarke. Bellamy makes his way back to The Gang, but they don't have a chance of finding McSteamy now that he knows he's being followed. Bellamy still wants to follow them, but Monty convinces Bellamy he'll bleed out and die if they don't get him medical attention. Unfortunately for McSteamy, Indra's news of the impending Ice Nation army have put Lexa in a bad mood, and - true to form - she goes back on her promise to him. She also drops his true identity - Roan, the Prince of the Ice Nation. SO GREAT, NOW NOT ONLY IS HE HOTTER THAN POMPEII, HE'S A BANISHED PRINCE? RUDE, Rothenburg. RUDE. We do get a lovely moment where Clarke actually spits in Lexa's face and tells her, "I'LL KILL YOU" before she's dragged away by Lexa's guards. Lexa might be upset, but I'm very okay with this. Meanwhile at Arkadia, Lincoln and Octavia's sexytimes are interrupted by the arrival of his friend Niko, who was badly hurt by the Ice Nation. They take him to Abby, but Niko needs a transfusion. Abby: He has a strange blood type we can't match! Jackson, Abby's assistant: Mount Weather has lots of blood! We can go there! Abby: Lincoln said that was a bad idea! Lincoln: I take it back! Abby: Okay, we're going to Mount Weather! They take Niko to Mount Weather and decide to open the place up while they're there, since it could help so many people. It's a lovely thought, but I have the feeling dire consequences are in order. I mean, it already has one dire consequence - Jasper is loose in the art storage room, destroying priceless works of art until he finds Maya's favorite painting (which he happens to hate). He sits and stares at it and cries. Octavia finds him and they have a bonding moment. If I were Octavia, I would've yelled at him for destroying an ancient discus-thrower sculpture, but Octavia is apparently a better person than I am. Meanwhile off in… wherever they are, Jaha's still tripping around in the 'City of Light.' He and ALIE think it's a real place, but it looks like a glorified mind palace to me. How is she supposed to fit every human ever in there? I have no idea. It's confusing. Emori tells Murphy that ALIE recruited her to steal tech and bring to Lurch, the random goon who appeared in the last season. But the Goon is also tripping, and so Emori decides to steal back the tech she already gave him. (Murphy's incredulous, too.) That doesn't go over terribly well, and the Goon attacks Emori. Murphy and Emori fight back, killing the Goon and stealing the boat. They leave Jaha and Emori's friend, Otan, who has drunk the proverbial kool-aid and now sides with Jaha and ALIE. Murphy, clever boy that he is, realized the 'tech' was actually ALIE's hardware, so he chucked it in the water and let Jaha fish for it while he and Emori stole the boat. Jaha isn't really worried, though, since ALIE assures him there is no pain and no death in the 'City of Light.' Cue the Goon (recently dead) appearing alive and well in said City. This just gets more confusing as time goes on. I can't wait for episode three. I've been a Bellarke shipper since episode one. They've come so far. They've been through so much. They've saved each other's lives, they've sacrificed themselves, they've gone to enormous lengths to prove they belong to each other. They're each other's best friend and co-leader. They're the peanut butter to the other's jelly, the filling to the other's Oreo cookie, the honey to the other's tea, the frosting to the other's cupcake, etc. etc. So why, after two+ seasons, does Jason Rothenburg give us an episode where literally everyone realizes how much Bellamy loves Clarke - and then gloss over it completely? Bellamy and Clarke share a beautifully touching, emotional thirty seconds together, and Bellamy goes practically ballistic with the need to rescue Clarke. Clarke sacrifices her own safety for Bellamy's. This is good stuff. This is stuff we've been waiting for, and yet it's like Jason is purposefully trying to distract us from it. Not in a good way. This really bothers me. I'm not complaining about the addition of Roan - in fact, I might start wearing a metaphorical 'I'm Here for Roan' tee shirt. If I'm being completely honest, I even ship Clarke and Roan (and I gave them a ship name: Cloan) - possibly a lot. But I've shipped Bellarke for two seasons, and I’m not about to stop. I don't know what Jason Rothenburg is trying to do with the viewers, but his attitude of 'I know you want this, but I'm going to jerk your leash just because I can' has the potential to get very, very annoying. I'm hoping he doesn't take it too far. 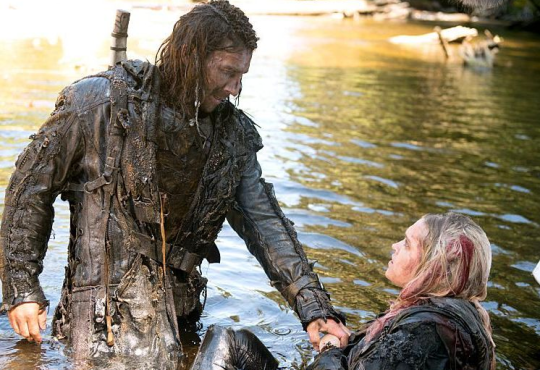 What do you think of Roan and the brief Bellarke moment? Are you liking season three so far? Let me know! I kinda stopped shipping Bellarke after a while. They seem more to be best friends than potential lovers. I hate Lexa. I love Roan and can't wait to see his storyline unfold, though I hope it doesn't mirror Lincoln and Octavia's relationship too much.